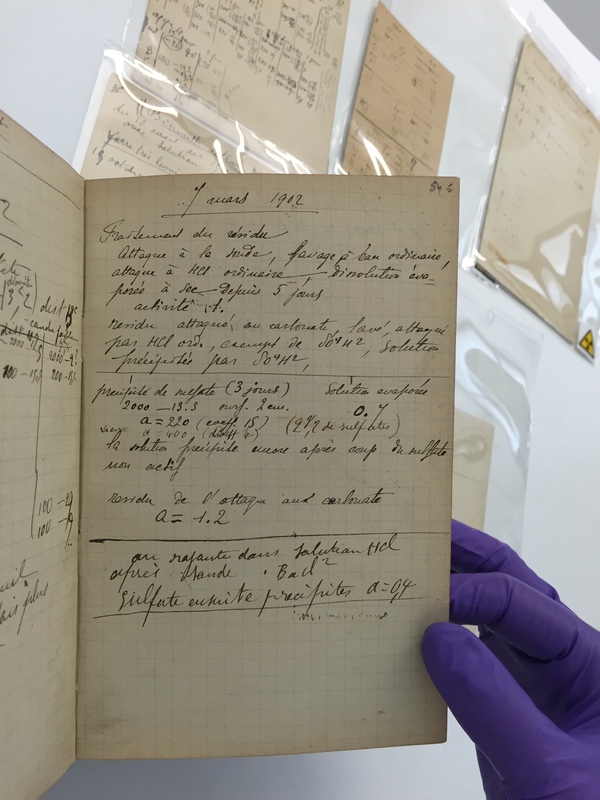 When Marie Curie scribbled in her notebook, little did she know that many years later, physicists would need to assess the contamination from the radioactive material found in the binding. Find out how Lindsey Simcox tackled the problem. As a radiation protection professional I’m acutely aware of the role Marie Curie has played in shaping the world around us. She was the first, and still the only, person ever to win a Nobel Prize in both Chemistry and Physics and was an Honorary Member of the British Institute of Radiology. 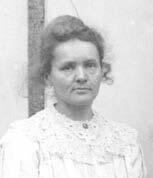 She discovered radium and polonium, and she gave her name to the original unit of radioactivity, the Curie, though this has now been largely replaced by the SI unit the Becquerel (Bq). Marie Curie left behind a substantial legacy, and not just one of scientific discovery. In the radiation protection industry within which I work, ”a radioactive legacy” is often a somewhat polite way of referring to containers full of radioactive waste, but in this case I mean something a little more academic. Many of her possessions are known to be contaminated with radioactive material, and in autumn last year I was faced with one of her laboratory notebooks and a lot of questions about what should be done with it. history. As a result, many thousands of readers visit the library each year, primarily historians, students and academics. However, anyone is free to visit once they have a library card. 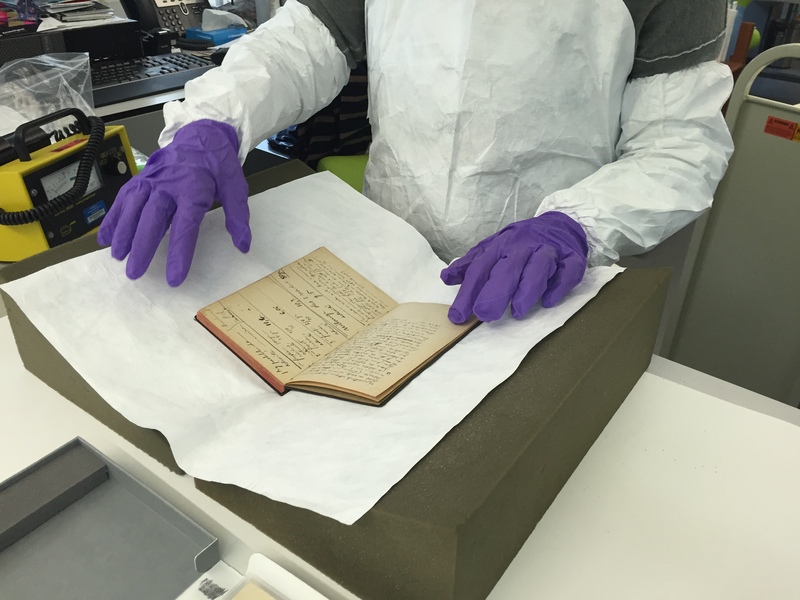 I was part of a team that was commissioned by the Wellcome Library to analyse the notebook and advise on what measures were needed to ensure the safety of the staff and public. The thought of assessing something that was so personal to one of the greats of science was daunting at first. However, after a little ”geeking-out” at such a piece of scientific history, we got to work. As suspected, our analysis showed the notebook to be contaminated with the radionuclide radium-226. To me, it was remarkable to think that the atoms of radium-226 within this book are the same atoms that Marie Curie herself painstakingly isolated from pitchblende, a black, rocky mineral. The process to grind, dissolve and heat the pitchblende would have been dusty and backbreaking work. Since one tonne of pitchblende yielded a miniscule 0.5g of radium, Marie and her husband Pierre had to process huge volumes of the rock to amass the quantity of radium needed for their experiments. 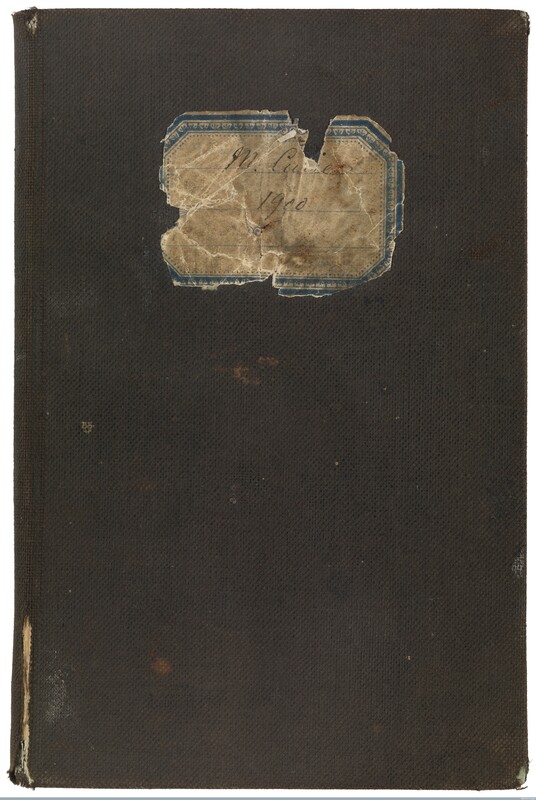 The total activity of the notebook was calculated to be around 120kBq (or 3.2 micro Curies) of radium-226. The radioactive material is fixed within the pages – in fact the majority is held in the back of its thick cover binding. You can just imagine Marie Curie placing it down on the dusty workbenches in her Paris laboratory. It’s worth noting here that radium-226 has a half-life of approximately 1,600 years, so the issues about keeping this notebook won’t be going away any time soon. We found that potential external doses to those handling the notebook were low; whole-body dose rates being marginally above the background of 0.1µSv/h. Even regular exposure to the notebook is likely to result in annual whole-body doses of less than 10µSv and hand doses of less than 35µSv. To put this in perspective, 10µSv is roughly the dose you would receive on a return flight from the UK to Spain. However, the notebook does potentially present an internal exposure hazard. The contamination is fixed within the book itself, but if its delicate pages or cover become damaged, then this could allow small fragments to flake off whilst the notebook is handled. A handling procedure is now in place to prevent the spread of contamination and as such aims to prevent ingestion or inhalation of radioactive material. This includes using a dedicated reading area away from the usual reading rooms, use of personal protective equipment, and extensive contamination monitoring during and after handling. When we consider all the other potential legacy items, this notebook could be a just drop in the ocean. 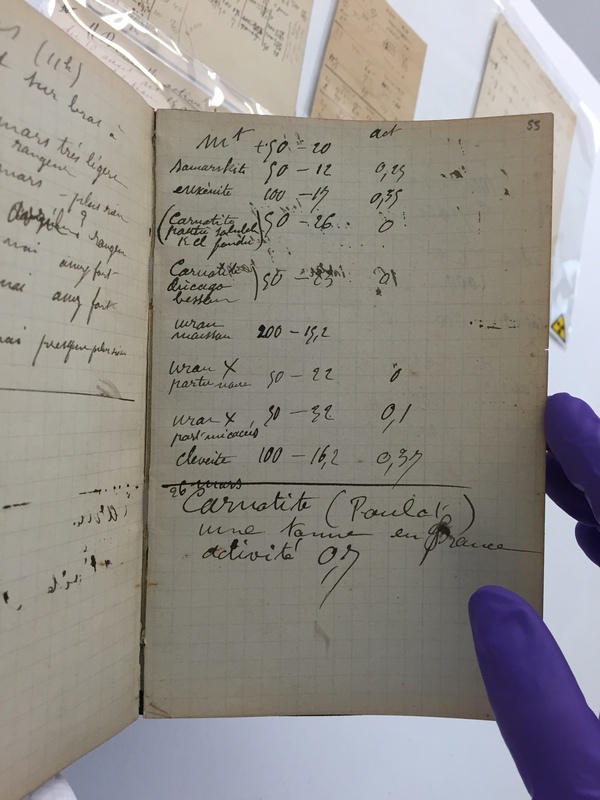 It’s likely that further items belonging to the Curies and their fellow pioneers in radiation science are squirreled away in collections across the globe, possibly without the knowledge that such items could be radioactive. Is it someone’s responsibility to attempt to locate those items, and if so, who? Who should pay for clearing up any contamination left behind? At what point does safety outweigh the preservation of history? These are questions that the radiation protection community continue to ask, but for now I’m just happy to have been a small part of the Marie Curie story.As you would imagine, the notebook does not sit easily within UK legislation on radioactive materials, however the Environment Agency were very understanding and suggested a way to allow public access by implementing some extra handling, storage and security measures. The notebook should soon be back on the public register to allow access to any Wellcome Library member who requests to view it. Lindsey Simcox is Health Physicist, Laser Protection Adviser & Trainee Radiation Protection Adviser at Aurora. Lindsey works with the team at Aurora to develop skills across almost all the aspects of ionising and non-ionising radiation services that Aurora deliver. In addition, Lindsey manages the provision of the company’s training courses as Aurora’s Training Champion. She currently chairs the Rising Generations Group of the Society for Radiological Protection which represents the interests of all members in the first ten years of a career in radiation protection. Lindsey gained accreditation as a Laser Protection Adviser in 2014 and is currently working towards obtaining accreditation for Radiation Protection Adviser (RPA) status. Whilst working to achieve RPA status Lindsey has become a member of a number of societies and continues to grow her knowledge base and experience. Posted on September 2, 2015 by birblog2013. This entry was posted in Uncategorized. Bookmark the permalink. I was very interested to read Lindsey’s article as I have previously visited Marie Curie’s Museum in Paris and her casket in the Pantheon. I was interested to read recently that when the bodies of Marie and Pierre Curie were exhumed from their burial site in Sevres in rural France to be relocated in Paris, that there were concerns that they may be radioactive ! – Surprisingly, on exhumation, Pierre was indeed radioactive but Marie was not!! It is now apparently thought that her death from a leukemic type illness may have originated from her well documented, intense use of X-rays during the First World War.